Men's spring jackets. Why would you want a jacket in spring? We tend to think of jackets in terms of winter and autumn. Once we finally reach the warmer months, our instinct might be to toss all of our coats into the closet without thinking of them again till September. You can rock these while staying cool all season, gents. If there was ever a timeless jacket for this list, it's certainly the trench coat. Though it has its origins way back in the mid-19th century, it made a splash during World War I. Its woolen ancestor was made obsolete by the demands of modern warfare and a lighter, more weather-resistant garment was needed. This practical garment thus became synonymous with the trench warfare that became prevalent during the war, hence the name. 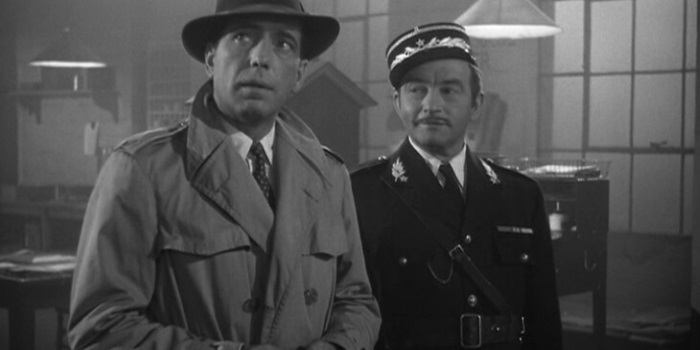 Humphrey Bogart wearing a trench coat in Casablanca. Click here to learn more about how warfare influenced menswear. The coat consisted of D-rings along the belt and back for equipment to be carried, flap on the right side for a rifle to rest, and a short cape so water could be thrown away from the body. It was long enough to keep the legs dry while staying short enough to avoid mud. Civilians adopted it as a way to demonstrate patriotism and respect for the armed forces, eventually becoming a permanent fixture in menswear. This classic is a little more on the formal side than the other spring men's jackets on the list, but it's the perfect addition to wear over a suit or a more casual shirt. If you're looking for maximum versatility in a simple lightweight coat, then look no further. The bomber jacket is also a product of military heritage and is perfect for either fall or as a spring men's jacket. The bomber first got its start in World War I, where the birth of the air war necessitated a garment for pilots that could provide warmth and comfort in flight. Over the years, it came to be embraced as a common feature of menswear. The bomber goes best with casual outfits. Click here for some tips on how to look superb while dressing down. The jacket's signature look consists of ribbed cuffs, a frontal zipper, and a defined neckline. Its original look was leather, but nowadays it can also be found in suede, nylon, and even polyester. Suede in particular can provide a smarter edge to an otherwise casual wardrobe. There are few items in modern menswear that are as iconic as the black leather motorcycle jacket. They were first produced by the brothers Irving and Jack Schott in 1928 as the “Schott Perfecto,” a reference to Irving's favorite cigar. They were designed specifically to provide comfort while riding a motorcycle. 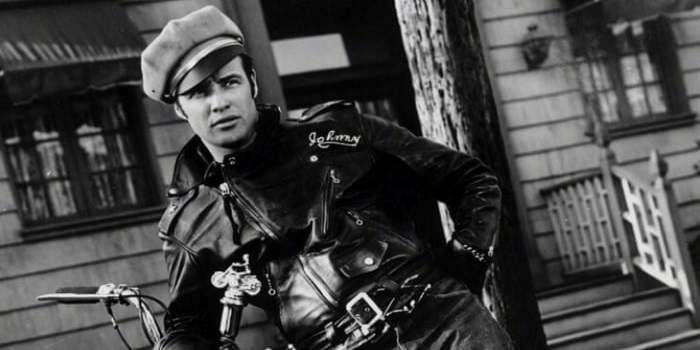 Marlon Brando rocking the motorcycle jacket. Click here to find your men's style icon. Despite the leather, the jacket can be thin enough to be worn in spring. It goes best with the combo made famous by Marlon Brando and John Travolta- a white t-shirt and jeans. It's even the signature piece of one of television's most powerful men, The Walking Dead's Negan. Few materials can do what denim can for casual menswear. 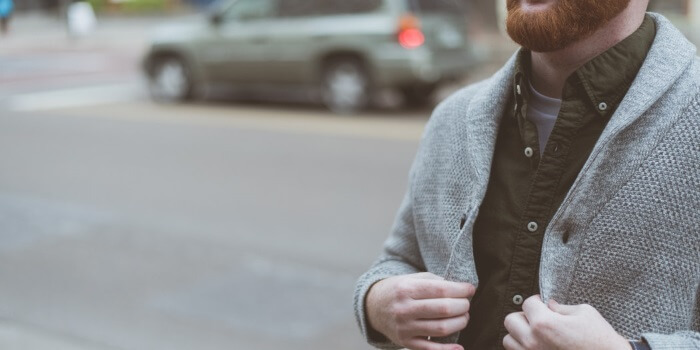 A well-fitted denim jacket can strike the perfect balance for a man that enjoys a more casual look while simultaneously driving home style awareness. Curious about how denim compares against other materials? Click here to see how it matches up against the leather jacket. Wearing this spring men's jacket with a t-shirt is an obvious choice, but it also goes great with boots for an edgier look. Though it goes well with jeans, try to avoid a similar hue to that of the jacket. A pair of chinos with brogues will give you a bit of a smarter style while staying in that casual spectrum. Out of all the great jackets on this list, there are probably none as versatile as the cardigan. It's a fairly general term, but it refers to any knit jacket that opens on the front. They come in hundreds of variations – be it color, pattern, and thickness. 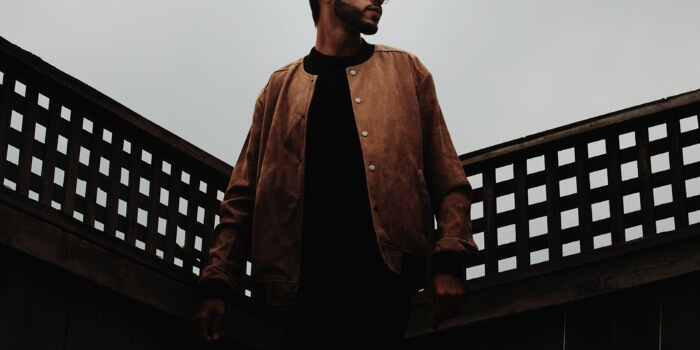 Want to learn more about this jacket? Click here to get the full scoop on the cardigan. There are few materials that stay as cool quite like flannel. Its soft texture is achieved through weaving cotton and wool. Though it originates from the country by farmers who took to its comfort, it's made significant headway into popular menswear. Like the farmers of old, it's favored for its comfort along with how effortlessly it upgrades a man's look. Flannel makes an excellent base for a casual wardrobe. You can find men's spring jackets in flannel through various colors. If you need help balancing colors, we got you covered. Though you can certainly find them in solids, the fabric's signature look is a checked pattern. It's meant to be casual, so take care not to wear it to any interviews. For the embodiment of sportsmanship and style, look no further. The varsity jacket is synonymous with the collegiate aesthetic. The jacket works especially well for warmer climates because it blends best with a casual T-shirt, jeans, and sneakers. It's a versatile garment that's not only great for spring but can be layered to be warm in the colder months. The Letterman is strictly a collegiate look. Don't wear it to an interview. With a history dating to 1865, this look is as timeless as it gets. Though it can be traced as far as 1938, this classic piece conjures memories of Vietnam-era soldiers in rough, olive-green jackets. The M-65 field jacket made its debut in 1965 and was quickly standardized in the US armed forces. The way they found themselves in the mainstream is quite unique. The M-65 Field Jacket is still a popular staple for rebels at heart. It was used by veterans and civilians alike to protest the war, making it a staple of a rebellious aesthetic. Though it's available in all sorts of colors, the classic “Olive green 107” is what retains its military heritage. Green can also be a powerful color when used correctly. Since the jacket was utilized as battle-dress, casual works best. Like many of the jackets mentioned on the list, it pairs best with a T-shirt. Avoid boots, as it can seem like you're trying too hard for the military aesthetic. This working-class icon came into the scene in 1915, when Hamilton Carhartt introduced duck fabric overalls for railway workers. the fabric is fairly heavy and made with 100% cotton duck fabric, which is tightly woven to utterly seal the fabric. This technique makes it resistant to wind and snags. True to its roots, it remains synonymous durability and comfort. It's classic men's style for the working man. If you gentlemen watch a lot of movies, seeing this jacket may remind you of that sequence in Spectre where James Bond is chased all over the Alps. The insulation provided inside the visible padding offers excellent warmth. While it's perceived as a winter jacket, the down can work just as well for spring. What makes them great spring men's jackets are the fact that they can be very lightweight. The fact that they're water resistant and easy to fold for transport makes them practical as well as stylish. In fact, they've become very popular among fraternities thanks to their utilitarian aesthetic. This mens spring jacket is all about the outdoors. if you're looking to go hiking or backpacking, you should invest in a shell jacket. If you go shopping for one, you'll find either “hard” or “soft” shell jackets. As the name implies, “hard” shell jackets are more heavy-duty. They're designed to keep you warm and dry for activities such as hiking or camping. Unless you're going on a long camping trip, opt for a soft shell jacket. A “soft” shell however, is more versatile. Not only is it water-resistant, but the fabric is more breathable than its counterpart. This lets you stay comfortable during more high-energy activities like biking or running. It's also a fashionable piece to wear in a cool, casual setting. Curious to learn more about workout wear? When cotton is waxed, it means that it's imbued with a natural oil or beeswax-based compound to waterproof the fabric. It's a timeless method that was in use since the 19th century. When manufacturing started placing emphasis on faster ships with larger sales, flax sales proved too heavy. To compensate, cotton weavers started impregnating their fabrics with wax to make them water-resistant the same way that linseed oil did with flax. The result was a lighter material that was just as sturdy. It wasn't long before waxed cotton transitioned from ship sails to menswear. By the 1930's the process of imbuing cotton with wax became common, as it allowed for excellent breathability and protection from the elements. The very same Scottish mill that produced sails for the fleet was not producing it as clothing on a larger scale. Waxed cotton isn't reserved for a specific kind of jacket, but it's common to see them on more activewear such as hunting jackets. It's even common on trench coats! Also known as a blouson, windbreaker, or golf jacket – made famous by James Dean in the 1955 movie “Rebel Without a Cause.” This lightweight jacket is made using various materials, but its signature is in its shape rather than the fabric it uses. You can tell a Harrington apart by the sleeve cuffs and waistband. Both are made with elasticized material that makes the jacket gather at those points, making for a kind of “umbrella” effect. The jacket also usually features a vent on the back designed to send rainwater away from your pants. The Harrington is related closely to the bomber. Like the other jackets on the list, it comes in various colors and fabrics. It can look great in a simple set of jeans and a t-shirt, or spruced up with a shirt and chinos. When worn right, it can make a man look both elegant and tough in one go. This jacket is one of many contributions made by the British to classic menswear. Its name is derived from its creator, Scottish-born Charles Macintosh. He discovered a way to maximize rain resistance by gluing two thin layers of fabric with liquid rubber. The Macintosh was patented in 1823, and by 1843 it surpassed any product in the market. Almost 200 years later, the jackets are still being produced in Cumberland, Scotland and circulated across the globe. Each jacket is hand-measured and glued with the same techniques used by Charles himself. The material is used to produce jackets in various styles – from the trench coats for the everyday shopper to uniforms for railway workers and British policemen. It's perfect material for spring and summer wear, especially if you're visiting the UK! There you have it gents, the best spring time outerwear. you've had a lot to process here. When it comes to men's spring jackets, we've only scratched the surface. Nevertheless, you're ready to add that extra edge to your springtime wardrobe – one that's both stylish and practical.